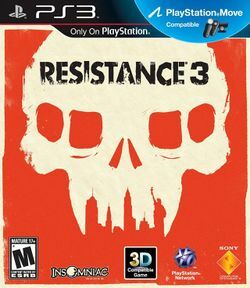 Resistance 3 is a 2011 science fiction first person shooter video game developed by Insomniac Games and published by Sony Computer Entertainment for the PlayStation 3. The game is the third title in the Resistance series and is the sequel to the best-selling PlayStation 3 launch title Resistance: Fall of Man and its sequel, Resistance 2. It is the first in the series to support 3D and PlayStation Move and the first to introduce the PSN PASS program. The game retains mostly the same gameplay mechanics as its predecessor albeit with several changes. The weapon wheel and health bar from the first Resistance game return after it was excluded from Resistance 2. There are also new environmental objects such as chimeran plants which explode when shot. The game sees a mixture of new and old weapons; returning weapons include the Bullseye, Magnum, Rossmore, Auger, Marksman and Carbine. New weapons include the Mutator, which shoots biological mist that causes enemies to eventually explode causing splash damage, the Deadeye sniper rifle, and a new food-can based explosive called a shrapnel grenade, which releases an arsenal of nails when it explodes. All weapons are upgradeable, and become more powerful the more they are used. In line with the survival theme of Resistance 3, humans are forced to assemble their weapons from whatever scrap they can gather. The game features PlayStation Move support and Stereoscopic 3D. Additionally, players can utilize the PlayStation Sharp Shooter peripheral attachment. Resistance 3 features 16-player competitive online multiplayer component. It offers five modes: Team Deathmatch, Chain Reaction, Deathmatch, Breach, and Capture the Flag. It also includes a customizable progression system where players spend points earned by playing online to unlock customized loadouts that include various tactical and combat attributes. There is also a co-operative mode where players can team up to play through the story mode either online or split-screen. The multiplayer maps are set in locations around the world, such as the Fort Lamy prison in Chad; the Seaside of Glamorgan, Wales, UK; Alice Springs in Australia; New York City in the United States; the Trainyard in Bogota, Colombia. Some of the locations these maps take place in are not included in the story mode. Global Resistance is a Facebook game designed to promote the release of Resistance 3, where players can choose to play as human or chimera. This page was last edited on 17 April 2012, at 07:22.